Congratulations *whistles* *claps* *drumrolls* Rehana, Kanu and Ankita. You are the three lucky winners from the pool of qualified* entries. *Many of the participants were disqualified because they had not completed the mandatory 'Follow By Email and verify' entry. Please make sure you subscribe to our email list using the widget on the top right side bar of this blog to make sure you don't miss-out on any of the posts or giveaways! 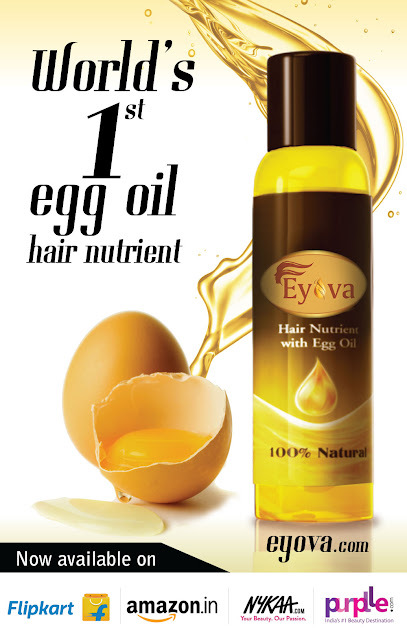 Eyova is a one stop solution to all your hair problems. Who said hair woes were reserved only for the Winters? It's Summer and the only think I can think about(besides ice cream and cupcakes ) is getting my hair chopped off! I have long, super soft straight hair which are wavy at the ends and I know it will kill to get them chopped off :/. I love long hair and haven't cut mine short since a year. I don't want to chop them off now but they are growing very moody and unmanageable these days, thanks to the hot weather in Bangalore. Being a beauty blogger, the wonderful benefits of egg to hair are not new to me but the thing is I have never dared to try it. I remember when I was a kid, me and my friends were playing holy. The whole jolly experience had turned into a dark and unholy one when one of friends threw an egg on my head. I bathed twice everyday for a week that time, still, I could smell the egg on me. Don't even get me started about how I felt when the egg was all over my hair with all it's wriggly juices. A short horror story. That's the reason I have never dared to treat my hair with eggs even when my hair needed nourishment. So dear wonderful readers, here's your opportunity to win your solution to gorgeous, healthy and lustrous hair. 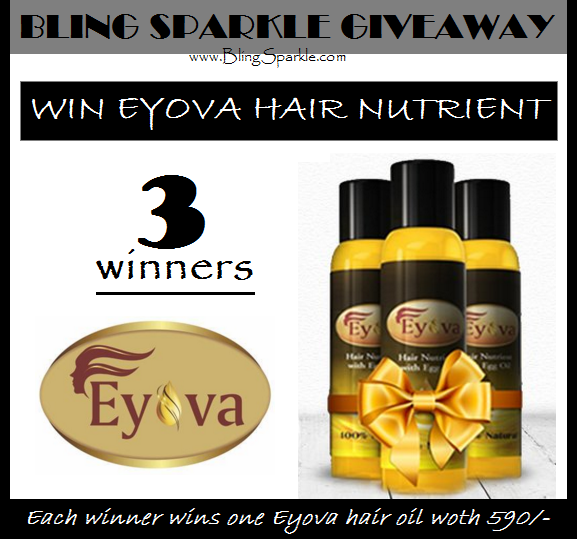 We have 3 bottles of Eyova hair oil up for grabs. Login into the Rafflecopter widget on the top of the post and complete the simple steps which will take you hardly two minutes. This giveaway is open only for residents of India. There will be three winners. Giveaway will run for a span of 15 Days. Winners will be announced as soon as the giveaway ends. Prizes will be shipped within a week after the giveaway ends. Winners will be chosen randomly using the Rafflecopter widget. RT this tweet and spread the word!